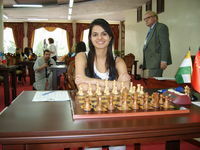 Ten teams will participate in the 2009 edition of the World Women Team Chess Championship. Top seeded is the first team of China, led by GM Yifan Hou, with average rating of 2490. Their main competition will come from Georgia, with Chiburdanidze on board 1, and Russia who come without the World Champion Alexandra Kosteniuk. India and the USA will be led by their dynamic duos, Dronavalli – Schadev and Krush – Zatonskih respectively. The other participating teams are Ukraine, Poland, Armenia, China B, and Vietnam, who can all bring surprises at the event. The opening ceremony is September 1st and rounds start on the next day. There will be a total of 9 rounds, round robin (eac plays each). Here are the team sfor the event, stay tuned for more information on Chessdom.com!